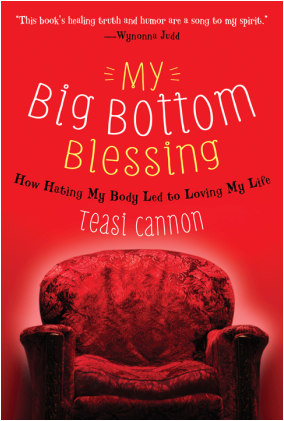 My Big Bottom Blessing is a book written by Teasi Cannon. Before I get into the book, here is a little bit about the author. loves to help women remember who they are in Christ. When I first received the book, I wasn't sure what to expect. Was it going to be a book where the author simply states the obvious and makes the reader feel less than human? Well, let me tell you, this book is awesome! The author writes in such a way that the reader can relate, without feeling bad or down about themselves as a person or their appearance. We all have things about ourselves that we like or that we would like to change, no one is perfect. This book is an inspiration to anyone struggling with issues of feeling you need to conform to society and look a certain way. We are all created unique, and that's what makes the world go 'round. In this book, the author helps you to understand that the way you are is the way you should see yourself. Meaning, no matter what you feel you need to do to change your appearance (weight etc), you look good no matter what. Stand up and have some confidence, because you are beautiful. And she doesn't do it in a way that makes you feel like you are watching some cheesy motivational video, she writes in a way that makes the reader feel comfortable, like reading a note from a good friend. I did not receive any compensation for this book. I did, however, receive a free copy of the book for my review. All the opinions I expressed are mine. It’s been said that real change happens when we become aware of the negative self-talk in our heads, and replace it with positive messages. This book takes it a step further, offering an honest look at one woman’s struggles with weight and body image. But rather than just “thinking positive,” she became deeply aware of God’s love for her. Knowing she was God’s beloved made it possible for her to love herself. I know all women, regardless of size, will appreciate Teasi Cannon's honesty!